Virus-induced gene silencing (VIGS) is a genetic technology that exploits the RNA-mediated defense against virus. The method has great potential for plant reverse genetics as it could knock down gene expression in a rapid way, which is triggered by a replicating viral genome engineered to carry a fragment of host gene to be silenced. A number of efficient VIGS vectors are available for dicots, such as for model plant Nicotiana benthamiana; however, only a few of VIGS vectors for monocotyledonous cereal crops. 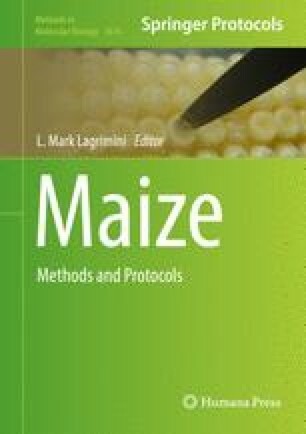 Here, we describe the method for the use of a newly developed VIGS vector based on a maize-infecting Cucumber mosaic virus (CMV) strain ZMBJ-CMV for maize. The RNA2 of ZMBJ-CMV was modified as a vector pCMV201-2bN81 having multiple cloning sites for the insert of 100–300 bp fragment of target gene. Using a method of vascular puncture inoculation of maize seeds with crude sap prepared from Agrobacterium-infiltrated N. benthamiana leaves, silencing of target genes could be obtained in 4 weeks. We thank Professor Dawei Li (College of Biological Science, China Agricultural University) for thoughtful advice. This work was supported by the National Natural Science Foundation of China (Grants 31371912 and 31570141), the National Basic Research Program of China (#2012CB114004), and a grant from the Ministry of Education of China (the 111 Project B13006).